Hearts of Stone is late game content that expands the existing region of Novigrad, adding more weapons, armour and enemies on top of the new quests and mass of new question marks to investigate on your map. It truly is an expansion like those of the past. While the extra area added is not massive, it is densely packed and beautiful to behold. The main quest of HoS starts innocently enough with a job to kill a creature that has taken up shelter in a sewer but quickly gets weird and surreal in a strangely charming way. You make a deal with a strange man in exchange for your freedom and end up having to fulfill a series of wishes for another character. These tasks involve such delights as organising a vault heist, being possessed by a ghost at a wedding and entering into a painted world. The writing is fun and the characters feel nicely fleshed out. Some parts were challenging to beat while other parts were simple but made you grin like an idiot. We see a more human side to Geralt that plays well in contrast to the lack of humanity in the characters of Master Mirror and Olgierd. It is all very well written and fits the quality of the main game perfectly. CD Projekt Red didn’t just sit back after creating a great new story though. They also implemented a new mechanic in the form of the Runewright. After helping to establish his workplace, the runewright can upgrade your equipment to give them interesting properties. The player must choose between this upgrade and the existing way of placing runes and glyphs on your gear. A single runewright upgrade requires three slots and offers versatile bonuses such as automatically deflecting arrows and permanent grindstone enhancement. With these upgrades and stronger weapons and armour, (such as the Viper gear, which uses the Kaer Morhen armour skin), you need something worthy to test it all out on. New enemies include giant spiders and renegade members of The Order of the Flaming Rose. Where the new enemies are really shown off though is in the new boss battles. There are not many in the expansion but the few that there are are perhaps the best boss battles in the entire game. They are challenging, fun and use interesting methods that force you to think fast and rely on skill. One of Hearts of Stone’s more terrifying bosses; The Caretaker. Something else that I feel HoS did really well was its homages to the original Witcher game. 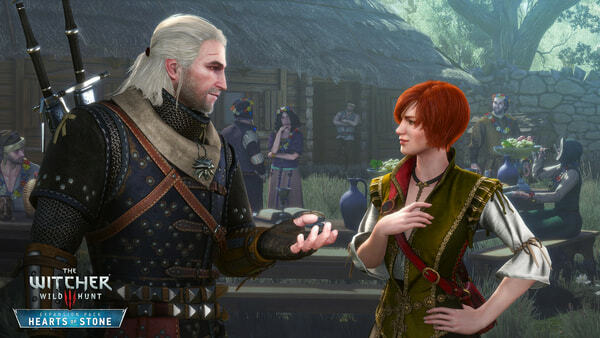 More than any other time in The Witcher 2 and 3, HoS has many callbacks and references to the first game that long-time fans of the series will recognise. The most obvious example is the inclusion of Shani, a medic who can be romanced by Geralt. In the first game, the player must choose between Shani and Triss Merigold and she had not appeared in the series since then. Then we have the members of the Order of the Flaming Rose, a group of knights who play a huge roll in the first game. There are also smaller but cool callbacks such as a certain pair of glasses that can be bid on during a mission that belonged to an antagonist of Witcher 1. The reference is cool, and so are the shades. Geralt looks pretty badass in shades. Geralt with The Witcher 1’s red-headed medic, Shani. 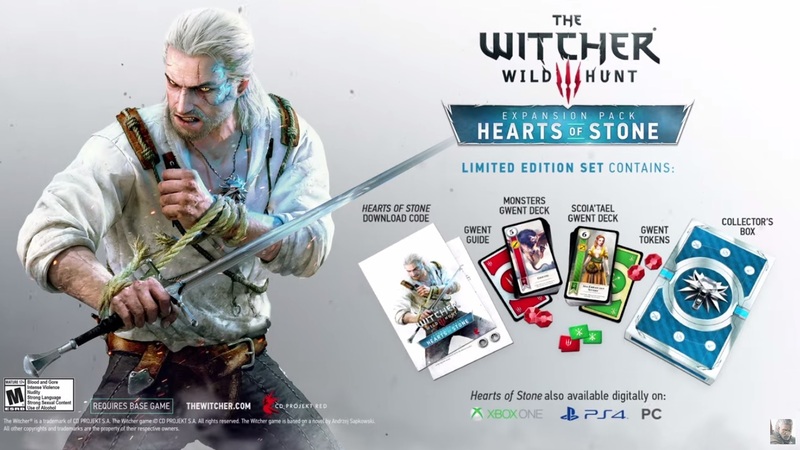 My final conclusion is that if you liked The Witcher 3 then you will love Heart of Stone. If you didn’t enjoy The Witcher 3, well, there’s no accounting for taste. I feel that CD Projekt Red upped their game for this DLC so I have great hope for the second expansion, Blood and Wine. I also hope that since HoS focused on elements of Witcher 1, BaW will return to some characters from number two. Geralt dons the shades of a long fallen foe to complete his badass looks. It is totally worth the money and I wholeheartedly recommend it.